(CNN) - Faced with growing pressure from educators, Arizona Gov. Doug Ducey announced Thursday his plan to give teachers 20% pay raises by the beginning of the 2020 school year. Under his proposal, teachers' pay would increase 9% in the 2018 school year, then another 5% for the next two years, which would boost the average salary to $58,130 from the current $48,372 by 2020. Teachers in Arizona are among those across the country pushing for better pay and conditions, inspired in part by teachers in West Virginia, who got a 5% pay raise last month after protesting. The teachers' union in Oklahoma ended a walkout Thursday after nine days. And educators there reacted to Dulcey's announcement with questions and skepticism. Noah Karvelis, a teacher and an Arizona Educators United organizer, said, "It feels like an attempt to stop whatever action we may have been taking, instead of a legitimate groundwork for future investment in education and to fulfill our demands. "This has made more questions for us than answers. We don't know the details. We don't know the funding sources," he said. For weeks, educators have been holding rallies in Arizona. On Wednesday, they participated in "walk-ins" before class, part of a series of escalating actions sponsored by the Arizona Educators United coalition. In a statement Thursday, the governor said, "Arizona teachers are the biggest difference-makers in the lives of Arizona's children, and we need to reward them for their hard work -- this plan does that through a 20% pay increase by school year 2020." 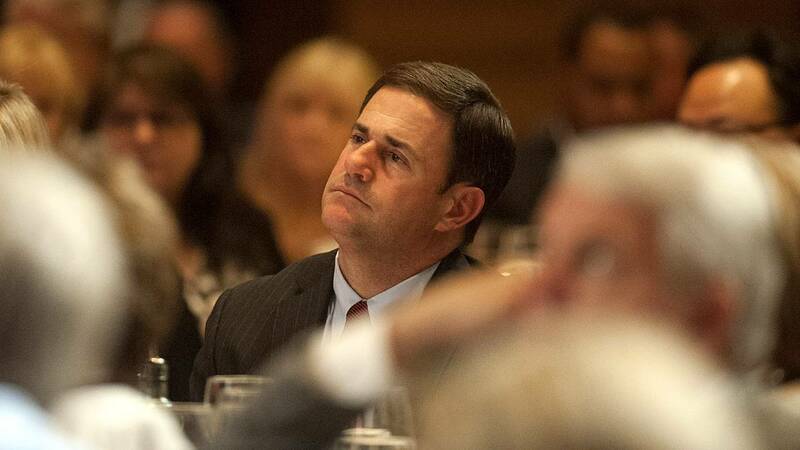 Ducey also proposed to restore education funding from recession-era cuts with $371 million phased in over the next five years "all without raising taxes while maintaining Arizona's balanced budget." The funding would be to support school resources such as infrastructure, textbooks, technology, curriculum and school buses. More dollars are available for classrooms and teachers, because the state's revenues are on the rise "combined with a reduction in state government operating budgets," according to his plan. But many teachers and education professionals said Ducey's plan lacked specifics and left out several of their demands. Vanessa Jimenez, vice president of the Phoenix Union Classified Employees Association, said her heart sank when she heard Ducey's announcement. "He made no mention of education support professionals," she said, pointing out that the language in the governor's proposal pertains to teachers' pay raises. "When I think of his proposal, it's an attempt to divide us," she said. "We're not going to be divided." The group has encouraged teachers and supporters to wear red to school on Wednesdays -- the color to reflect their frustration. They call the movement #REDforED, using the hashtag in social media posts. The group has indicated that walkouts could be next.